Plan ahead: Pre-chop veggies over the weekend to easily throw together nutrient-packed salads throughout the week. Walk it out: Break up the work day with a 20-minute brisk walk. Drink up: Drinking plenty of water throughout the day keeps you energized (and it’s great for your teeth, too!). Sleep like a baby: Turn off tech devices an hour before bed to improve the quality of your sleep. Make a trade: Trade out processed snacks for healthy whole foods like apple slices, almonds, or baby carrots. Keep smiling: Call us at 480.786.4000 to book your next checkup to keep your teeth and gums happy and healthy. 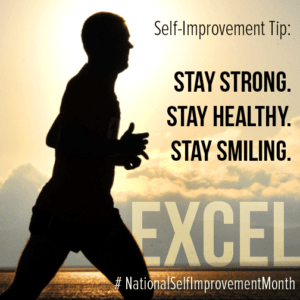 Stay strong, stay healthy, and stay smiling! If you feel like your appearance could use a little improving, now’s the perfect time to claim the smile you deserve. Talk to your Chandler dental experts during your next checkup about Smile Design!